Fr. Evan Armatas talks to an Orthodox doctor about Ebola and then takes questions on a variety of topics including women's roles in the Church and praying for the dead. 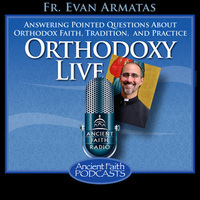 On this episode of Orthodoxy Live, Fr. Evan answers questions from listeners on a variety of topics including contemporary Christian music, monastic titles, and more. This special episode features part one of the commencement address of Mother Raphael, the Abbess of the Monastery of the Holy Myrrhbearers, to the graduates of St. Vladimir's Orthodox Seminary. Fr. Evan discusses verses 1-5 of Mark 16. Among the questions raised for Fr. Evan tonight were: Difference between compassion and love? Discerning God’s will in certain situations. A healthy description of spiritual fatherhood.